We just bought our first boat after 5 summers of owning a lake house. 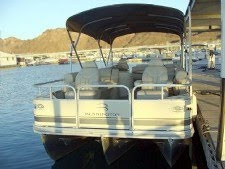 We have a 2005 25 ft Bennington pontoon. It has blue detail coloring on the side, which is perfect b/c we are Michigan Wolverine fans. Was hoping to get the big M symbol with a Michigan saying of some sort? Note: this picture is not the actual boat described, but a random pontoon boat we've used for other posts.